Known as sakura in Japan, the Japanese flowering cherry tree is a showy ornamental species native to eastern Asia. It is widely cultivated for its attractive form and springtime display of fragrant, pale-pink blossoms. 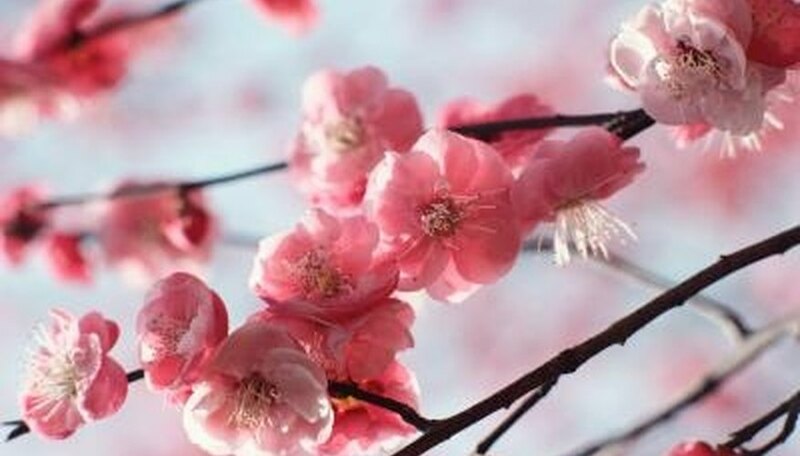 In the United States, Japanese cherry blossom trees grow best in climates corresponding to the United States Department of Agriculture (USDA) zones 5 to 8, although they will survive in zone 9 with minimal springtime blossoming. Caring for Japanese flowering cherry trees begins at planting, however minimal upkeep is required once the tree is established. Test the soil acidity before planting a Japanese flowering cherry tree. It must have a pH between 6.7 to 7.1, which is mildly acidic to neutral. If it tests above 6.7, add lime to the soil to lower the acidity. If it tests above 7.1, add pelletized sulfur to raise the acidity. Plant the Japanese flowering cherry tree in a hole corresponding to three times the volume of the original nursery container. Amend the displaced soil with compost to increase drainage and provide adequate nutrients. Sprinkle 10-10-10 ratio fertilizer in the bottom of the hole before planting the tree. Water it thoroughly. Mulch a 5-foot radius around the base of the tree to maintain adequate moisture and inhibit the growth of weeds. The mulch layer must be at least 2 inches thick and there must be a 5-inch gap between the mulch and the base of the trunk. Water the tree to a depth of 6 inches twice a week for the first year. Decrease watering in the winter to once a week to allow the tree to go dormant. Once established, water once per week to a depth of 5 inches, and more during periods of drought. Remove any crossed or tangled branches from the center of the crown to increase air flow. Prune the tree in late winter using a sharp pruning saw. Feed Japanese flowering cherry trees with 10-10-10 ratio fertilizer in early spring before the buds begin to swell. Water liberally after fertilizing. Prevent and treat pest infestations with neem oil. Pour 1 cup neem oil into a hose-end sprayer and liberally douse the foliage, branches and trunk. Reapply the solution following heavy rain showers. Wear goggles when spraying neem oil. How Big Do Flowering Plum Trees Get?